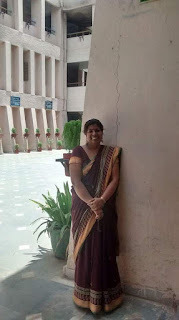 Summer holidays and I am looking for opportunities to drape a saree. 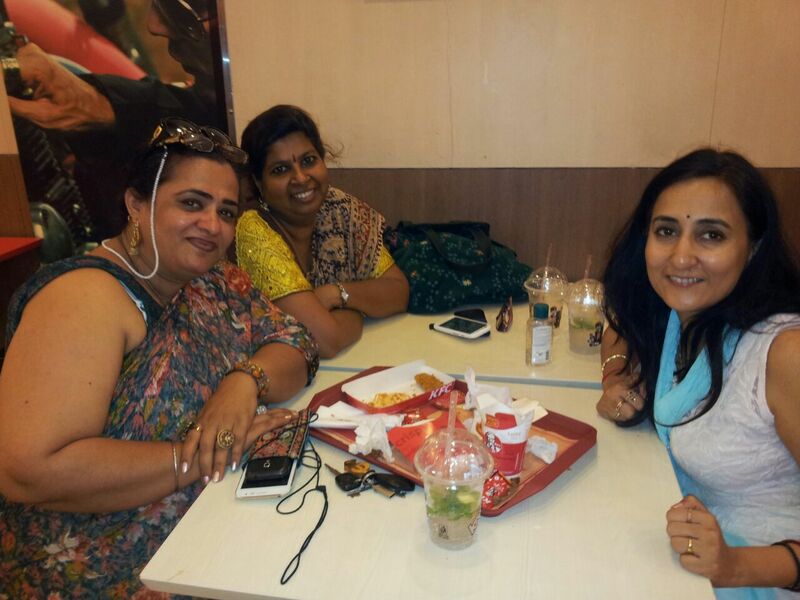 How does one write about meeting school friends after 32+ years? All of us passed out from Lady Irwin School, Delhi. And that single fact has helped in bonding us. It hardly matters who was in Science and who was in Humanities. I don't even remember. My memory is about the good times we had in school, the reading of M&Bs in the classes, the sport activities and our teachers. 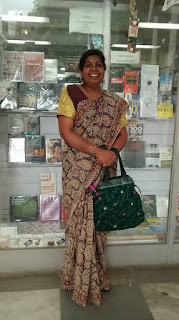 My saree is a Kalamkari cotton recently bought from Nalli. Very soft and easy to drape. 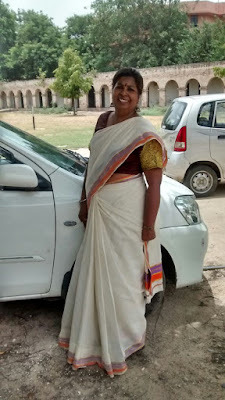 I paired with a khadi blouse and earrings bought from a flea market. 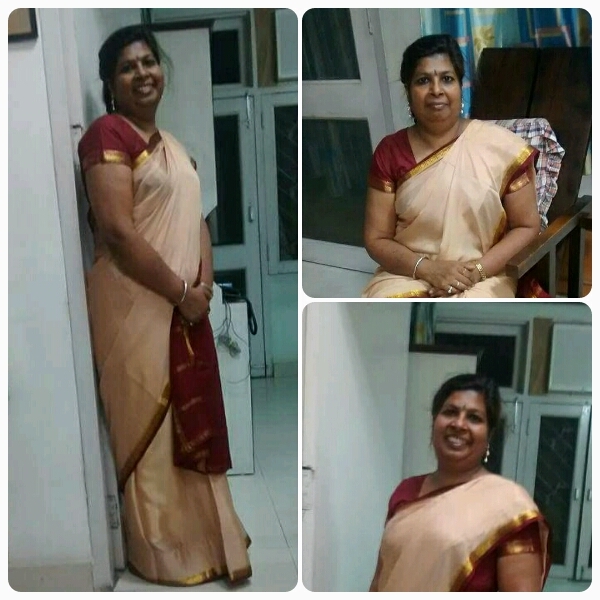 One of my friend's too turned up in a saree, a light printed chiffon. Last day of Summer vacations. I and mom went to my brother's place. I wore a long skirt with printed top. Sharing that here. Our dept. conducts seminars during summer vacations for teachers every year. It is done subject-wise. At one time, it used to be for two weeks, which was reduced to one week, then 5 days and now for 4 days only. I am not going to comment on the learning aspect but it sure feels good to meet other teachers from the same subjects from other schools. Sometimes the infrastructure, where is seminar is being conducted is good. At times, it is not up to the mark. Yet somehow we end up waiting for the next year's Seminar. Such official gatherings means one can drape sarees. More so after signing the 100 saree pact. 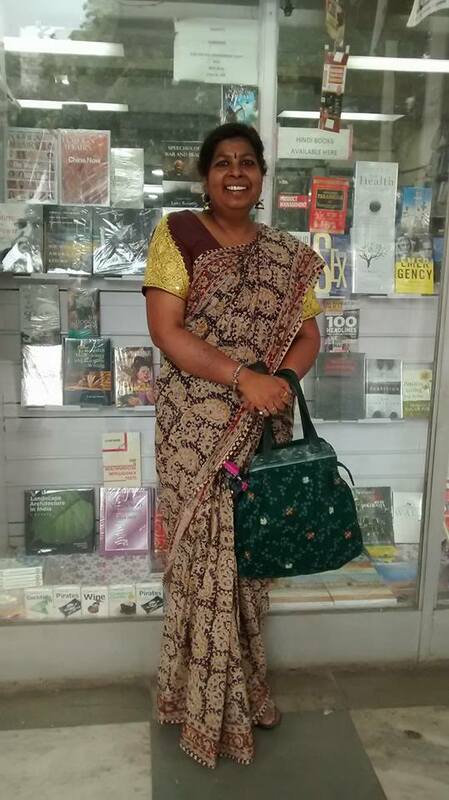 Here my saree is a Bengal Cotton, what is basically known as taant. Light shade of mustard and very easy to wear. It has bootis all over. I wore it with a contrast blouse. I think, my youngest SIL bought it from Kolkata when she had gone there for an official tour. She had brought sarees for all of us. This one she had given to mom. Accessories are only my ear-drops randomly bought from a local market. Seminar day 2. On day 1, there was not much accomplished. Except for catching up with old friends. I and another colleague of mine had a great chatting session. We simply needed to share our thoughts and all that had happened in the past one year. The hall is big but fans are far between. As Delhi is reeling under heat wave, those fans don't help. Sitting at one place for 6 hours with 30 min break is a bit too much. What do we do? We walk out of that hall and walk the corridors to beat the heat. Today, in the last session, we were given a topic and do free writing on that. I composed a poem in less than five minutes and read it out. Felt good to do so for an audience, that too in a saree! I am draping a Kasavu cotton saree with orange, mauve and gold border. I had bought it from Kochi airport way back in Mar 2012. 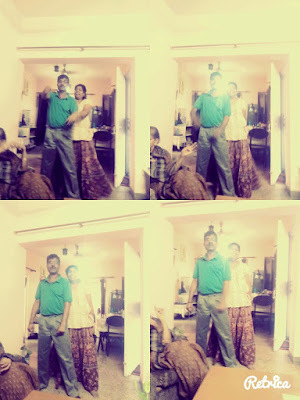 My brother, his family, mom and I had gone on a vacation to South. We visited Meenakshi temple, Rameswaram and finally travelled to Munnar. I virtually did no shopping exceot for various spices and tea from the tea gardens. When we were returning, it hit me hard in the airport that I had not bought a single saree for myself and mom. So I ended up buying this saree and a dupatta for myself along with another saree for mom. The blouse is khadi, dark brown with typical khadi embroidery in yellow. I am very partial to Khadi blouses. My Jhumkis are bought from a local market. I have draped this saree once before in August 2012 on the eve of Independence day, with a green blouse to give it a tricolour affect. I have a picture of that. See the last photo. About this saree, I had bought it for my mom some 12 years back. She draped it only once and gave it back to me as she wears light coloured sarees. It is a soft cotton saree with a beautiful border with a matching blouse piece. It has small hand embroidered flowers all over the body. I seldom wear the matching blouse with that particular saree. However, this blouse goes with few others sarees too. My ear-drops are made from cane and I bought those from Dilli Haat, INA fairly recently. Very lightweight. Hot humid Delhi. And you are invited to a housewarming party. What do you do? You go there in a cool cotton saree!! I am doing the admissions for Class XI, so I went to that housewarming party directly from school. This saree belonged to my mom and now it belongs to me. How? We had gone to a resort in Toshali, near Puri, way back in 2004. One of those days, we visited my eldest Mami. My eldest mama is no more and my mom is very fond of her SIL. This saree was a gift to my mom from her SIL, my mami. Such a beautiful Odisha Sambalpuri Handloom cotton. 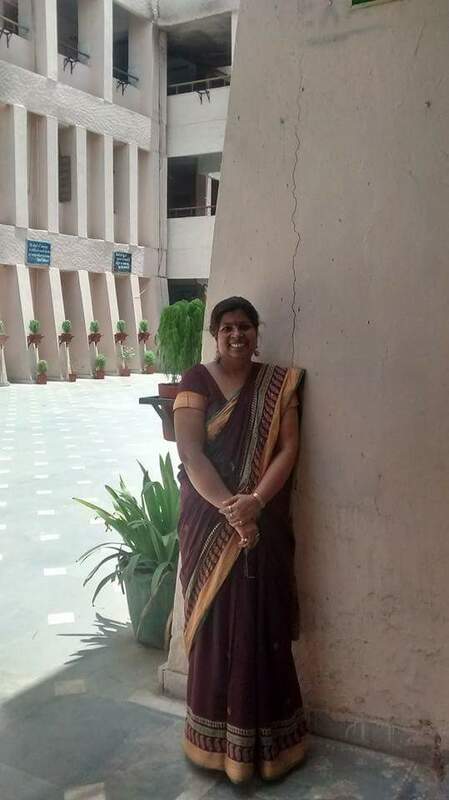 (I too was gifted a saree but that story is for another day). Both the sarees were gifted with falls and sides stitched along with blouses and petticoats. (Readymade choli cut cotton blouses are easily available in Odisha and West Bengal). I draped that saree on that resort for some kind of function with a black sleeveless blouse. After that, I have draped it many, many times with different blouses. Mom is too happy to see me wearing it and gave it to me. Today I draped it with one of my favourite Khadi blouses and the lightweight cane earrings. I love the body, the border and the pallu of this saree. I bought this Mysore silk saree, only one in my collection till date, in Bangalore in 2003. It is easy to drape but I have not draped it much. Maybe twice. I bought that blouse from Nalli long time back. It goes with many of my sarees. 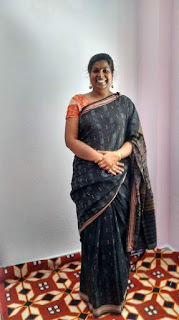 I draped it for a date of sorts and he was pleasantly surprised to see me in a saree. Accessories, as usual, Pearl ear-drops! Very predictable, no?! Maa has stitched that skirt, it is totally umbrella cut. Georgette. Kurti is a gift from my SIL, Sujata Tripathy. Stole bought from Himachal Emporium. Very old. I wear it everywhere with my western attires. Some of our friends are forever. And when they say, we must meet, one has to do that. 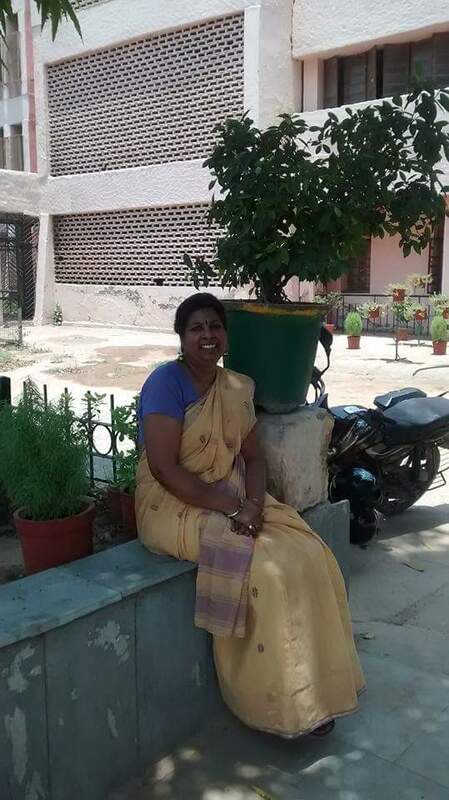 Sarita Saxena, and I were colleagues from 1997 to 2008. A firm friendship formed between the two of us and we used to take leave from school to hangout with each other. At one time, she used to be only one possessing a credit card and we used to go shopping on the strength of that. I especially remember one such time. It was 31 March. Results had been declared. In those times, after declaration of result, students as well as teachers did not have to stay back for that day. I, Kavita and Sarita went to a CTC sale. It used to be a big event at one time. None of us had much money in our pockets except for Sarita having a credit card. 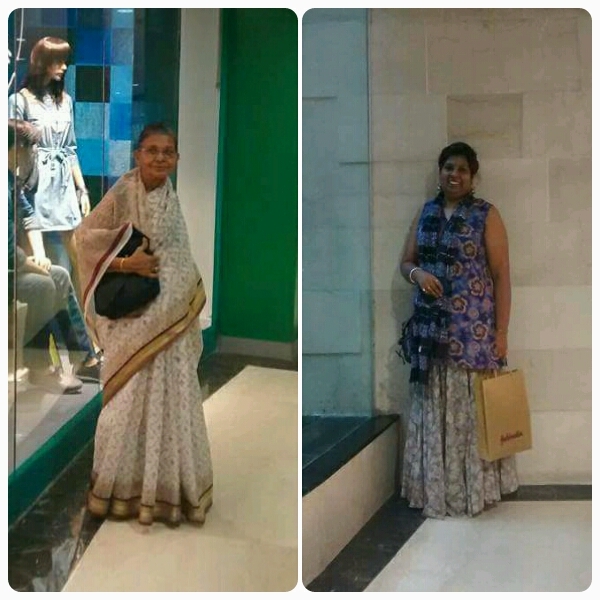 We shopped and shopped upto her credit limit. 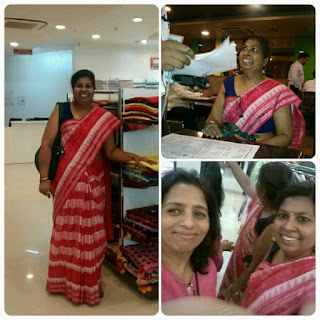 I bought four sarees and when I drape those, I remember that day vividly. Today when I met her after two years, the years in between simply melted away. 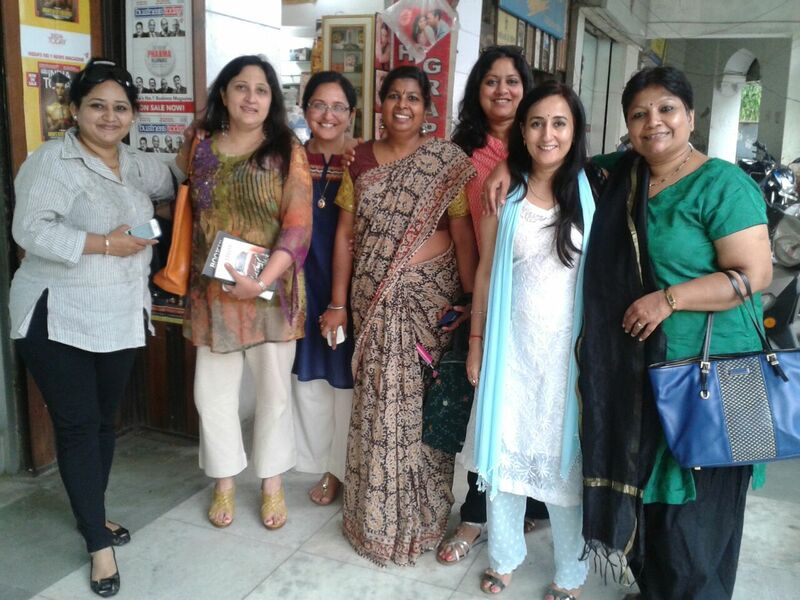 We shopped at Gurjari, Nalli and Khaadi Gramyodog Bhawan. We had lunch at Sarvana Bhawan and coffee at Cafe Coffee Day. In CP, New Delhi. Now about the saree, this is a Odisha Sambalpuri cotton saree. I bought it in mid may, this year from the state emporium. Wore a plain dark blue contrast blouse. The eardrops are from a local market. I tried my best to persuade Sarita to drape a saree as well. Maybe next time.